Great Britain's Chris Froome lies 10th overall, 14 seconds off the pace, after the shortened first stage of the Tour of Romandie, Switzerland. Froome, who won the event last year, is returning to racing after recent illness and injury problems. The Team Sky rider, 28, has not raced since March, when he finished sixth in the Tour of Catalonia. Michael Albasini of Switzerland won the stage, which was reduced from 203km to 88km because of snow. The Orica-Greenedge rider triumphed in a sprint after two hours, 11 minutes and 11 seconds ahead of Spain's Jesus Herrada and Lithuania's Ramunas Navardauskas. Michal Kwiatkowski of Poland, who won the prologue in Ascona on Tuesday, retained the overall race lead, but he is only five seconds ahead of Albasini. 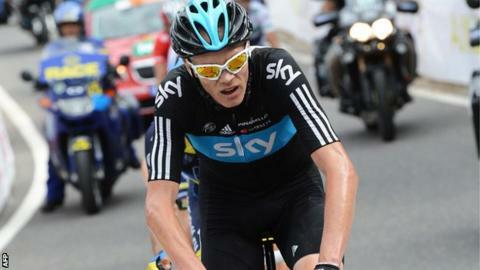 Last year Froome followed up his victory in the six-day event by winning the Tour de France.